I had some leftover buttermilk and that screams biscuits to me. I tried Alton Brown’s Southern biscuit recipe and it was simple enough. The biscuits were tender and light, but surprisingly squat. 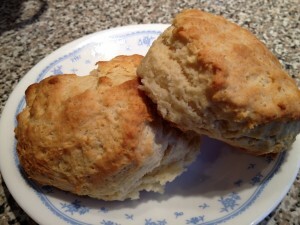 I re-read my blog about buttermilk drop biscuits I made in January 2013 and had the same problem, different recipe. I thought it was my baking powder and got a new can, so I can’t blame it on that again. I think I’ll stick to my favorite cream biscuit recipe.